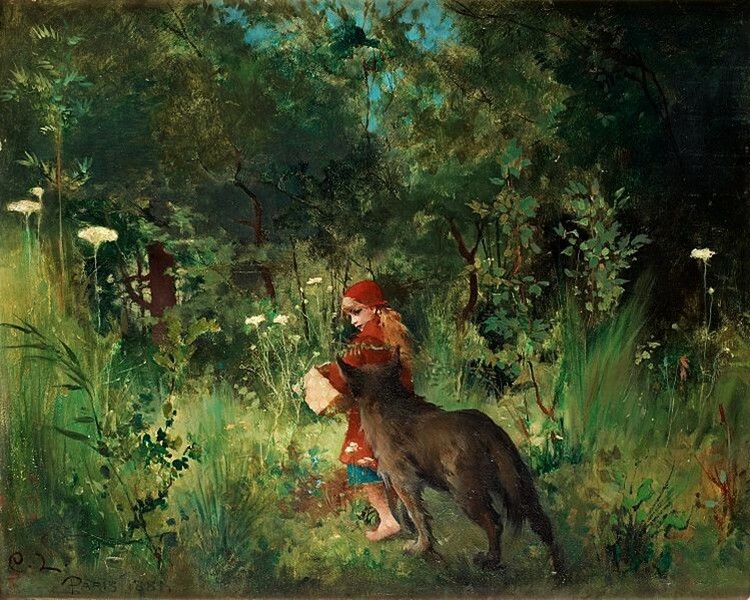 In the old fairy tale of Little Red Riding Hood, the child in the story remains nameless, defined and identified solely by her red-hooded cloak. In the same fairy tale, the villainous wolf is broken down and his identity exposed by Little Red's recognition of his suspicious parts. "The better to greet you with." Trauma, illness and crisis can manifest itself like the wolf. Coming to terms with your situation is like greeting something darker then you had expected. A voice deep inside you that resonates with ramifications throughout your life. Realizing the truth of your situation, as you start to see the bigger picture and feel the weight of the scope of it, is enlightening and scary. Dealing with the chaos of your altered reality successfully is aided by the support of those around you and accepting belief in yourself. Circling the wagons and pulling people close can provide great comfort in times of turmoil. Trauma, illness and crisis are like violent attacks. They affect every part of who you are. They tear with invisible teeth, leaving you exposed, hurt, and vulnerable. Trauma wounds on very deep levels. Surviving can be like living in a nightmarish fairy tale, surreal and too real simultaneously, defined by its parts. But we can not forget an actual girl wears the red-hood and a villainous wolf lurks with great intent on harm. We may have to wear the hood for a while, but who we are can remain whole beneath it. We may have to fight an obvious enemy disguised or hidden from view, but we can be honest about what we are facing and what it looks like to us. In truth, any happily ever-afters are elusive, and it is the journey we are on which makes our stories worth telling.